We're More Than Just A DJ Service, We're Entertainment! - For 25 to 1000 people! - We use Laptops for quick music searches/song cueing! - Great to use up to ~ 300 ft for announcements, toasts, introductions, etc. - The price we quote for your event is it, no strings attached! 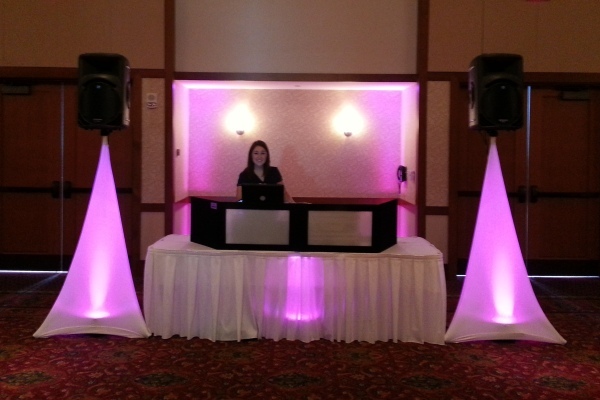 Our DJs can be as interactive and upbeat, or as formal and background as you would like them to be. You determine the type of atmosphere you want for your event and we'll supply you with the right DJ / KJ / VJ or Crowd Interactive DJ to fulfill your needs. - Alternative, Metal, Rock, Country, Oldies, Beach Music & more! Our clients hire us for a reason... they simply want great Entertainment! We will have a request book for the students to write their request on and we will try to play all of them (if appropriate of course). We DO NOT allow anyone to give a "shout out" to anyone in the crowd using our microphone for several reasons such as you never know what a teenager might say and screaming into a quality microphone will rupture the diaphragm of the mic! Throwing a birthday party, sports banquet, pool party or other special event? RSP Entertainment has party and karaoke packages to suite your needs. Don't think your event is too small to hire a DJ. We have packages that cover as little as 25 people or so, to larger packages that can rock the house all night long. Karaoke also tends to be a favorite at these types of events so be sure to ask if at all interested. Who knows, we may discover the next big music star at your event! The special day has arrived and the last thing you need to worry about is hiring appropriate entertainment for your guests. 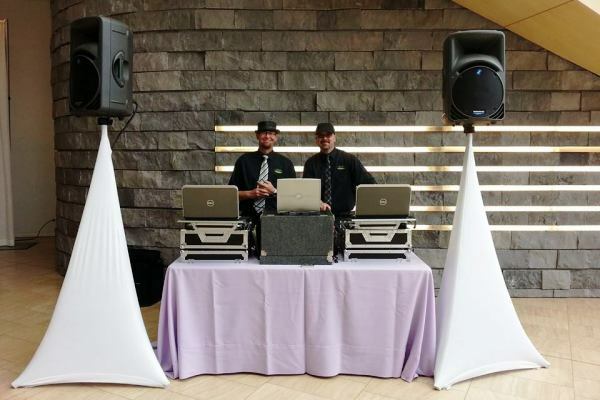 RSP Entertainment has plenty of exciting and quality packages that would make any wedding reception successful. The DJ is always appropriately dressed in professional attire and the music selection is discussed with the bride, groom and associated planners well in advance of the wedding day. There are no last minute surprises when you hire RSP Entertainment for your wedding receptions. A Reception Planning Guide with helpful hints, tips and a traditional reception format is provided for those interested in hiring us for their big day. A face-to-face meeting to discuss your reception can also be arranged upon request. We are a professional service wanting to add that finishing touch to your special day. Throwing that end of the year picnic, holiday party or just having a friendly gathering for your employees? RSP Entertainment has the right DJ, VJ or Karaoke Package for you and your associates. Whether the event is held in an elegant hotel or in an open field by a lake, the entertainment you need is only a phone call away. Due to the particular needs being different for every club, prices vary accordingly depending on the amount of gear, time, and planning needed. The best way to determine a club rate is to deal with it on an individual basis. DJ Flex is one of the Best DJ's in Roanoke spinning everything from Dance, Trance, Hip-Hop, Trap, Dubstep, EDM, R&B, Rap, Rock, Metal, Country and more to the crowd's delight, so please call for more information. Helpful hints on how to save money @ your party & get the entertainment you want! Your guests won't remember what the flowers looked like or how the food tasted, and many won't remember how the tables were decorated. But they will remember if they had fun at your party or not! Make it unforgettable, not just for you, but for them as well. Don't cut corners when it comes to your entertainment. If you must, choose less expensive floral arrangements or decorations. Instead of choosing fancy finger foods, consider having good food and plenty of it. Rather than having an open bar, have people pay for their drinks. They're less apt to get inebriated, and your conscience will feel better. What's all the decorations and food worth if everyone leaves due to poor entertainment? Take care of what people will remember first... then sweat the details ;-). Copyright (c) 2002-Present by Roy Shannon Prusak "RSP Entertainment, LLC"